The City of St. John’s is pleased to offer free swimming at the outdoor pools in Bowring Park and Bannerman Park during the busiest, and often warmest, weeks of the year. These outdoor pools are now closed for the season. 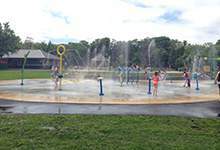 The splash pads at Bowring and Bannerman Parks are an alternative to cool down during any remaining hot weather days. Both splash pads are operational during the summer from 9 a.m. to dusk, and the last day of operation in 2018 is on Labour Day Monday, Sept. 3. The City’s outdoor pools are opened for the weeks we are likely to receive the highest overall attendance. We’ve tracked attendance throughout the years and have noted that as summer comes to an end and families and students prepare to go back to school, we have lower attendance at our pools. All City pools are staffed by certified lifeguards. When our outdoor pools are operational the number of lifeguards we require more than doubles. Many of our lifeguard staff are post-secondary students, some attending institutions outside of the province, and have to prepare to return to school before the Labour Day weekend. Indoor pools at the Paul Reynolds Community Centre, 35 Carrick Drive, and the H.G.R. Mews Community Centre, 40 Mundy Pond Road, are operational throughout the year – check the swim schedules on our website.